Commercial success in the pharmaceutical industry requires that clinical programs, in addition to demonstrating clinical effectiveness, also provide data supporting a drug’s value. 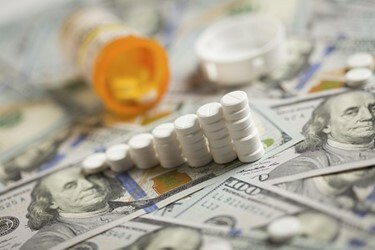 The Institute for Clinical and Economic Research (ICER), a U.S.-based cost-effectiveness watchdog, recently released an analysis suggesting that Vertex Pharmaceuticals’ cystic fibrosis (CF) franchise — Kalydeco, Orkambi, and the recently launched Symdeko — while offering meaningful clinical efficacy, would require discounts of approximately 70 percent1 to be cost-effective. Here, we review ICER’s cost-effectiveness analysis of the Vertex CF franchise to highlight lessons for orphan drug developers related to clinical trial designs and outcome metrics that would facilitate more favorable cost-effectiveness evaluations by stakeholders who employ cost-utility modeling (e.g., ICER, U.K.’s National Institute for Health and Care Excellence [NICE]). In a cost-utility model, health economic analysts strive to calculate the incremental cost to gain an extra quality-adjusted life year (QALY); they estimate a therapy’s impact on the level of utility patients are deriving from their life based on their health status and incorporate these data into a quantitative estimate of QALYs (Figure 1). The goal of the cost-utility analysis is to determine whether a therapeutic intervention changes the QALYs that patients will accumulate over a set time period (e.g., lifetime), and at what added cost. The threshold for what is considered an acceptable incremental cost per QALY varies by stakeholder; ICER typically presents a sensitivity analysis across a range of thresholds (e.g., $50,000 to $500,000 per QALY for an ultra-rare disease like CF). In our view, data gaps opened the possibility of a potential undervaluation of the Vertex CF transmembrane conductance (CFTR) modulators on several metrics and, ultimately, on overall survival in the context of the ICER model. 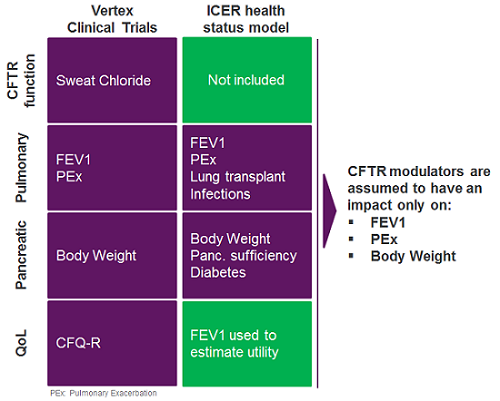 Vertex’s pivotal clinical trials captured the effect of CFTR modulators on the two organs chiefly affected in CF — the lungs and the pancreas — with outcome metrics for pulmonary function, percent-predicted 1-second forced expiratory volume (ppFEV1), and pulmonary exacerbation rate, as well as pancreatic sufficiency (body weight) (Figure 2). However, data on metrics assessing emerging complications (e.g., CF-dependent diabetes or bacterial infections), impact on use of other medications (e.g., pancreatic enzyme replacement therapy, mucolytics), reduction in healthcare resource utilization, or reduction in disease burden were far more limited, but these attributes were included in ICER’s cost-effectiveness analysis. Lacking clear clinical trial data on the metrics outlined above, health economists relied on arguably conservative assumptions to estimate the impact of the Vertex CFTR modulators on these domains. Because the Vertex CF franchise has a relatively short market history, and the long-term risks/benefits of the drugs are incompletely understood, assumptions to model the long-term impact of these medicines were also necessary. For instance, to evaluate survival, ICER modeled the impact of CF-related diabetes in its analysis of CF patients’ health status. Owing to the dearth of clinical trial data on CF-related diabetes in the development program for the Vertex drugs, the company’s CFTR modulators were assumed not to impact this outcome (Figure 2). Treatment with the Vertex CFTR modulators was also conservatively assumed to have no long-term impact on weight after an initial increase and, without long-term data, the drugs’ impact on ppFEV1 beyond two years of treatment was modeled as a 50 percent reduction in the rate of ppFEV1 decline. Notably, several CF experts interviewed by DRG consider it possible that early treatment of newborns could prevent disease development. The potential impact of early treatment with CFTR modulators on disease development and survival was not explored in the ICER analysis; although little data is available to support such an impact of the Vertex drugs, ICER has considered such scenarios largely unsupported in other evaluations (e.g., a cost-effectiveness evaluation of Spark Therapeutics’ Luxturna for the treatment of retinitis pigmentosa). The translation of clinical trial data to utility is a second area wherein a manufacturer may lose traction in a cost-utility analysis, if the utility calculation isn’t sufficiently comprehensive or if the drug’s data package is insufficient to support its impact on all relevant metrics. In the ICER analysis of the Vertex franchise, health economists used the ppFEV1 metric to derive a utility curve by assigning a level of benefit to a specific ppFEV1 value. Although this is the most straightforward approach, it also results in an assessment of health benefits that relies exclusively on a mechanical respiratory metric, which may not adequately capture the quality of life experienced by patients, especially considering the multi-organ nature of CF. Indeed, at the May 17 presentation of the ICER model, stakeholders from the Cystic Fibrosis Foundation levied this criticism. Furthermore, ICER’s sensitivity analyses showed that changes in the relationship between ppFEV1 and utility could significantly affect the overall cost-effectiveness assessment. Notably, an alternative scenario in which the utility was increased by 5 percent, to account for clinical effects of a drug beyond pulmonary function, led to a 15 percent decrease in the cost-effectiveness ratio. Similarly, the impact of the Vertex franchise on payer budgets in the ICER model related only to pulmonary supportive care, while other non-pulmonary expenses remained unchanged — an assumption made in the context of available data, but one that may not fully reflect the benefit of the drugs. Furthermore, the CFTR modulators did not impact the burden of supportive care for CF patients in the model, nor did they impact patients’ productivity. Ultimately, suboptimal alignment of clinical trial data with the demands of a comprehensive (e.g., multi-organ) cost-effectiveness model may have diminished the opportunity for the Vertex franchise to perform maximally in this cost-utility analysis. Although clinical outcome data collected by Vertex was sufficient to gain an FDA green light, it was not sufficient to support a comprehensive analysis of cost-effectiveness in this multi-organ disease. As such, assumptions regarding drug impact were necessary in areas not adequately supported by data, opening the possibility for a suboptimal cost-effectiveness evaluation. To support more favorable and data-supported evaluations, developers should design clinical trials with an eye on cost-effectiveness. Prior to initiating clinical trials, manufacturers should consider how a health status model is likely to be designed to assess cost-effectiveness. They should consider enrolling the assistance of academic researchers to understand which metrics may be important in such a model and to aid in the development of a reliable model in an area where none is established. With this analysis in mind, developers should strive to design a clinical program that covers relevant metrics and the durability of a drug’s impact on them. Indeed, an alternative scenario developed by ICER showed that a change in the long-term effectiveness assumption on ppFEV1 would have a profound impact on the final cost-effectiveness assessment; for Kalydeco, assuming no decline in ppFEV1 after the first two years (rather than 50 percent) decreased the incremental cost-effectiveness ratio ($ per QALY) by approximately 35 percent. Developers should work to understand how key clinical metrics in a given disease area are translated into utility. In a disease with an established function, it is prudent to carefully survey the relevant literature. 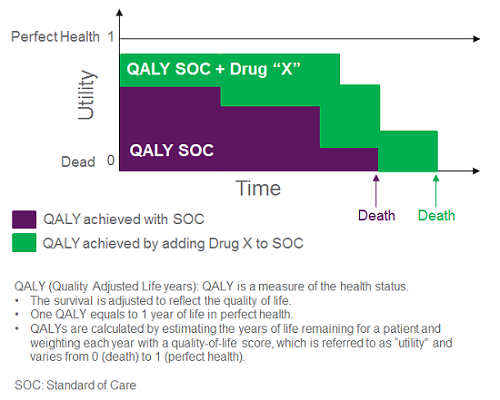 When developing a pioneering treatment, manufacturers should consider investment into the development of a utility curve that accurately accomplishes this, which would likely facilitate a reliable QALY calculation or at least more detailed/specific alternative scenarios and sensitivity analyses. Understand the patient journey and track healthcare resource utilization during a clinical trial to more fully support an accurate assessment of cost of care, as a favorable impact on direct healthcare costs is important to attain widespread reimbursement. Although metrics such as burden of care, caregiver burden, or productivity loss are difficult to rigorously track, they can be immensely valuable in highlighting the favorable indirect effects of disease-modifying drugs beyond the clinical efficacy. Understanding patients’ pain points and, ideally, tracking these metrics when possible (e.g., with real-world data or social media listening analyses) may further strengthen and support conventional metrics from clinical trials. As market access hurdles intensify, and ICER’s analyses increasingly inform payer policy, anticipating and preparing for cost-utility analyses early in the design of a clinical program will be paramount to support a medicine’s value proposition with U.S. insurers. Claudia Dall’Osso, Ph.D., is a principal business insights analyst on the Infectious, Niche, and Rare Diseases team at Decision Resources Group, specializing in niche and rare indications. Before joining DRG, she held a management and strategy consultant position at Precision Medicine Group, where she worked for clients in the biopharmaceutical, medical, device and diagnostic industries. Dall’Osso completed her master’s in management at Harvard University; she also holds a Ph.D. in medical genetics from Brescia University in Italy and a B.S./M.S. degree in medical biotechnology from the University of Milano in Italy. You can reach her at cdallosso@teamdrg.com or connect with her on LinkedIn. Ian Love, Ph.D., is a senior business insights analyst in the Infectious, Niche, and Rare Diseases department at Decision Resources Group. He specializes in atopic dermatitis and a diverse group of rare diseases. He received his doctorate in biomedical sciences from the University of Massachusetts Medical School and his B.S. in cell and molecular biology from Worcester Polytechnic Institute. Prior to joining DRG, Love was an instructor in the Department of Internal Medicine at Virginia Commonwealth University, where his work focused on understanding the regulation of programmed cell death by the tumor suppressor p53. Nuno T. Antunes, Ph.D., is senior business insights analyst on the Infectious, Niche, and Rare Diseases team at Decision Resources Group, specializing in antibacterial agents. Previously, he was a Latin America Market Access senior analyst in the Global Market Access Insights team, where he developed expertise in market access, pricing and reimbursement, health technology assessment, and health policy. He holds a Ph.D. in animal health from the Universidad de las Palmas de Gran Canaria, Spain, and a D.V.M. degree from the Universidade de Trás-os-Montes e Alto Douro, Portugal. Prior to joining DRG, he conducted research in antimicrobial resistance and antimicrobial development, and worked in the medical device industry as a scientist.